The energy turnaround with its rising energy prices, volatile energy markets and a growing responsibility for the environment presents a challenge for the manufacturing industry. Especially the energy & resource efficiency in production becomes more important in order to fulfill normative standards and to remain competitive. At the same time production plants can lower their costs due to the flexible use of energy and support the electricity grid. In an interdisciplinary team with more than 20 co-workers the research team “ETA | Energy Technologies and Application in Production” strives for a vision to shape tomorrow’s industrial production more energy efficient, energy flexible and resource efficient and thereby contributing to a more environmentally friendly production. 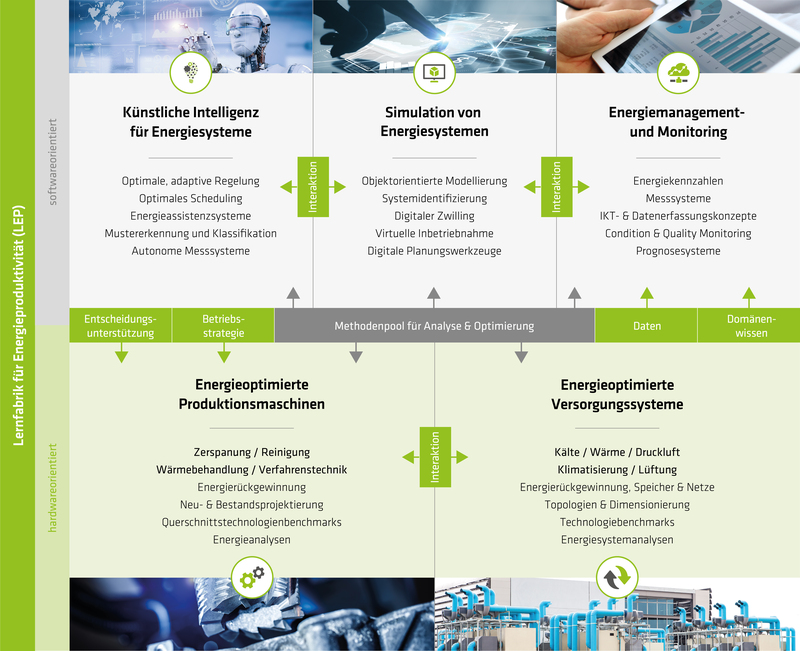 “Artificial Intelligence for Energy Systems”. The body of research reaches from the energetic optimization of individual machines to the holistic energetic Optimization of complete production environments. The efficient dimensioning of components and systems (machines, supply technology) as well as the synergistic interaction of interconnected systems and control technology issues are part of our research. Different simulation models used in the development of energy efficient machines, machine controls and the planning of production and factories are being developed. But digital tools are not only during the simulation process the core competence of the team: valuable energy data are the basis of all analyses and a requirement for the subsequent optimization. The methodical and efficient acquisition and analysis of energy data by machine learning and artificial intelligence are in varying degrees important components of the research activities.